It is hard not to get discouraged when evil and wicked people get away with what is reprehensible. Christians on every continent have things that greatly trouble them about the evil perpetrated in their corner of the world as corrupt power abuses those who belong to God's people. Let's join together, believers from all around the world, and ask God to intervene in a clear, decisive way, and bring these days of violence and wickedness to an end! 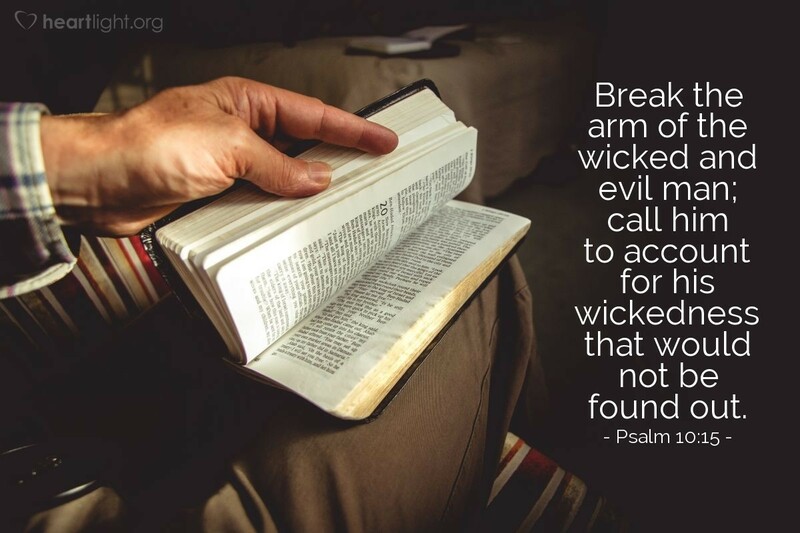 Holy and righteous Father, please break the power of wickedness that reigns in our world and bring it to an end. Make it clear that the fall of evil's power is at the hand of the Lord Jesus. Lord Jesus, destroy every power that stands between God and us, and bring to a glorious beginning the eternal reign of your Kingdom. To your glory, Lord Jesus, and in your name I pray. Amen.